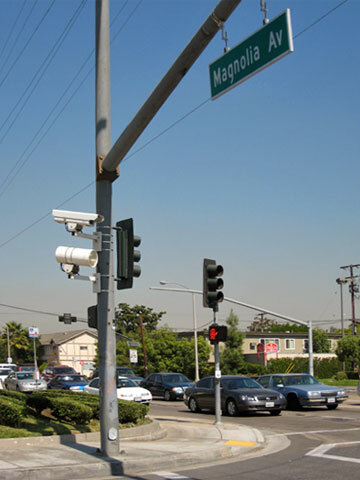 This photo from sch2006 shows a one of the cameras and strobes from a red light camera system in Fullerton, California. Unlike a typical traffic camera, this camera is located closer to the ground and is positioned to get a clear photo of a car's license plate as it passes through the intersection. Flash from the strobe lights briefly illuminate the intersection while pictures are being taken. There are currently 6 users and 24 guests online.